Objects and Pixels and Paths, Oh My! Here’s the promised follow up on last week’s post where we compared vector and raster images. Now we’ll uncover why it matters (or when) in regards to your marketing, such as when you’re ordering company shirts or talking to your web designer. First, there’s a huge difference in the file structure between vector and raster (more commonly referred to as a bitmap). Vectors are made up of objects, such as lines and shapes (paths), that can be selected individually or in groups and manipulated. Bitmaps are made up of a grid of pixels, each one being a solid block of color. Depending on the resolution of the image, there could be hundreds to thousands to millions of pixels comprising the picture. Editing capabilities differ greatly between the two formats. Scale its size up or down without losing sharpness of quality – think about your logo on anything from a button to a billboard. Move specific elements around to fit the space better – is your logo or artwork appearing on a horizontal, vertical or square space? Easily (with exceptions, of course) convert your artwork to one or two colors, which is usually more cost effective on branded promotional items. 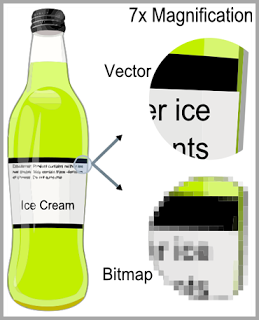 You can export the vector to any number of bitmap formats: bmp, jpg & more. You can only reduce the image dimensions; if you try to enlarge it, you’re increasing the size of the pixels and the image quality goes right out the door. If you need to fit bitmap artwork to a certain area, you’ll either need to crop it down, shrink it proportionally or distort it to fit the space. Not so easy (or pretty) to convert to two color (one color would just be a big blob – probably not the marketing look you’re going for). Two color will look like a half tone print and again, probably not your goal here. You can’t export, save or easily convert* a bitmap to a true vector, it just doesn’t work that way. Lastly, your need will dictate which format is required. Bitmap images make beautiful photographs, they’re great for web graphics and most formats can be viewed by anyone. But, if you’re going to have business materials, promotional items (pens, shirts, totes, etc.) or most any professionally-related marketing materials printed, you will be asked to provide your logo and/or other artwork in vector/eps format. Most processes work with eps without question, from screen printers to embroiderers to engravers and beyond. It’s common to have a pdf version of your logo, and you may be wondering if that’s a vector or raster file. Truth is, it could be either depending on how the original file was created and saved. The only way to know is to open in a vector program, such as Adobe Illustrator, to find out. *Now for the asterisk I snuck into the last Bitmap bullet point: What to do if you don’t have the logo in vector format or, had it once upon a time but now only have the jpg? It’ll need to be converted/recreated in a vector drawing program, and because you’re pretty sharp, you realize I can help you out of this sticky situation. So don’t be shy, it can usually be done quickly and at a minimal cost – get in touch to learn about your options.